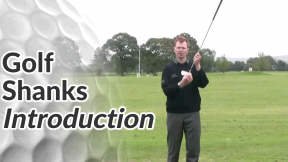 To fix a golf shank so that it never embarrasses you on the course again, we’ll quickly recap the causes of shank shots and then look at 2 drills to eradicate them from your game. 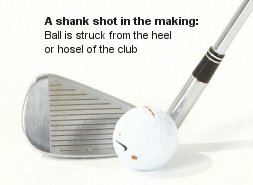 If you shank the ball on a regular basis, there’s a good chance you also suffer from a slice (also caused by an over-the-top swing path). You might want to see my step-by-step series for fixing a slice for good. Using your 7 iron, set up to the ball as normal. Take care to focus on your distance away from the ball as well as maintaining good balance throughout your swing. 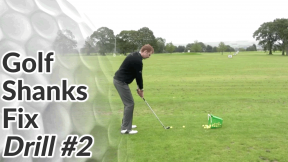 Start by placing the club behind the ball at address and make some good quality practice swings. 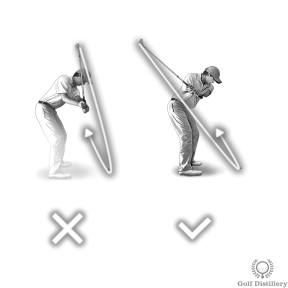 However, during your down swing, pull the club inwards towards your body so that you actually miss the ball and brush the ground inside the ball. Repeat this process until you can confidently strike the floor in the intended area. 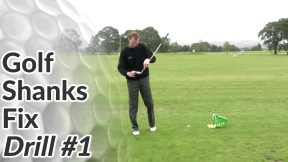 Now make some swings with a similar feel but this time aim to just clip the ball from the toe edge of the club. Done correctly, this will produce a weak ball flight that shoots out to the right and also sounds like a poor contact. It may even look like a shank but will feel very different. Adjust slightly to hit the ball out the middle of the club. If ever you’re worried about hitting a shank on the course, just make some practice swings addressing a specific patch of ground and then brushing the turf inside that patch by pulling the club in during your down swing. 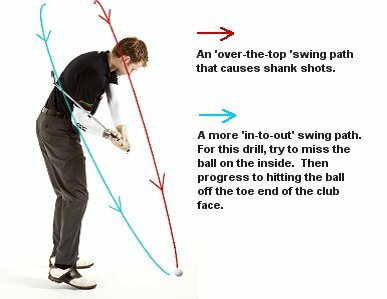 Then set up to the ball and maintain a swing thought of hitting the ball right out the centre of the club.